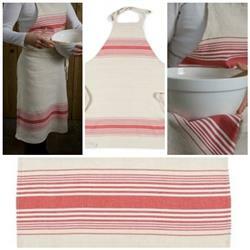 Casual comfort combined with refined class mark this 100% linen chef's kitchen apron. It features a red stripe pattern on natural flax background, and measures 28" x 40". Complete your coordinated kitchen decor with matching kitchen towels, napkins, table runners and placemats.